a lot of art in me that is screaming to come out. thanks for the support over the years!!! Ok! This is my first FAC story so please comment! You would have wanted to know some things about Detective Conan, I do make referances to past cases. But heres a story with Sato and Takagi and others that you'll find out about later! Hey, thanks for the lovely comments. Hey, haven't seen you in a really long time. Hope you post more art soon! 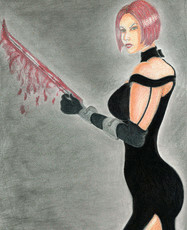 Hello' i seen u said u had an ADA Wong drawing? can i see it??? and thanks for all the nice comments on my pics much appreciated !!!! !